Russia and the US have agreed on “concrete steps” to ensure a long-term ceasefire in Syria and fight their common enemies, Al-Nusra and Islamic State, Foreign Minister Sergey Lavrov said after meeting with US Secretary of State John Kerry. “We believe that those who remain in the positions occupied by the terrorists [from Islamic State and Al Nusra Front], despite numerous months of calls to leave [the areas], don’t differ much from terrorists,” Sergey Lavrov noted during a joint conference with his US counterpart in Moscow. 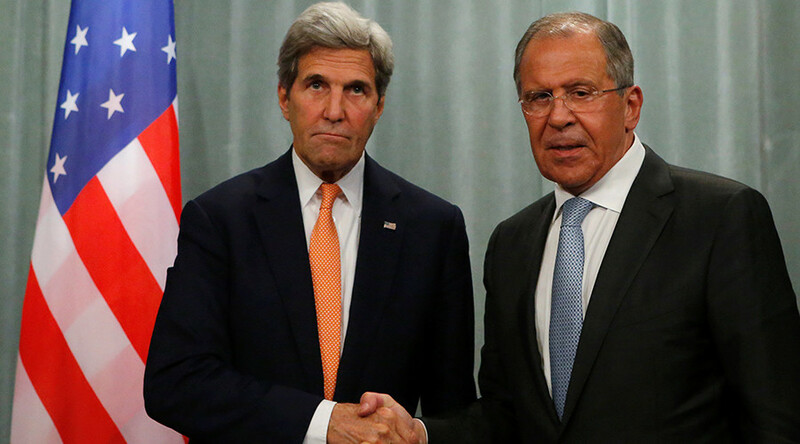 Lavrov and Kerry met in Moscow a day after the top US diplomat talked with President Vladimir Putin. Syria and Ukraine were among the main subjects discussed. Particular attention was paid to strengthening the cessation of hostilities in Syria, which was introduced by the UN Security Council based on proposals from Russia and the US, the Russian FM said. According to Lavrov, both sides agreed on concrete steps that need to be taken to shore up the ceasefire in the war-torn region. “We have confirmed our goals to destroy the threats that come from the so-called Islamic State, Jabhat al-Nusra and other terrorist organizations and to stop feeding terrorism, which comes from the outside,” Lavrov said. “It is possible to help restore the cessation of hostilities, significantly reduce the violence and help create the space for a genuine and credible political transition,” he added. The same sentiment was echoed by Lavrov. “We’ve agreed on concrete steps, but these steps can’t be expected to lead to immediate results. We need to implement them, and we have an agreement on how and when to do it. This is a very concrete result of today’s negotiation marathon,” said the Russian FM. According to Lavrov, the common goal for Washington and Moscow is to provide for a long-term ceasefire in Syria. This, however, doesn’t apply to Islamic State and Al Nusra Front. Despite the increasing number of settlements adhering to the Russia-US brokered ceasefire regime that came into force on February 27, not all the groups claiming to belong to the “moderate” opposition are observing the truce. The most recent example of this took place earlier in June, when militants from an Al-Qaeda-linked group, Jaysh al-Islam, shelled a UN humanitarian convoy near Damascus, according to information from the Russian Defense Ministry. When asked whether battling Al Nusra Front could harm anti-Assad forces, Lavrov, taking the mic from his US counterpart, reminded the reporters of Afghanistan and Libya, where getting involved with extremist forces brought only chaos. “They thought that the Mujahideen would inflict maximum damage on the Soviet Union in Afghanistan, and then they can be ‘tamed’. But ‘taming’ did not work. Al-Qaeda which was born from the Mujahideen, attacked New York September 11, 2001…,” Lavrov remarked. Neither Lavrov nor Kerry mentioned whether they had discussed closer military cooperation in Syria between the US and Russia on Thursday. Earlier, the Washington Post had obtained a draft proposal indicating that the US would seek to create a joint HQ with Russia to share intelligence and conduct “synchronized” strikes on Islamists in Syria.